An essential collection of William Faulkner’s mature nonfiction work, updated, with an abundance of new material. 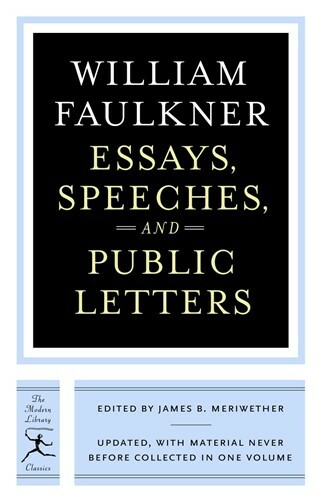 This unique volume includes Faulkner’s Nobel Prize acceptance speech, a review of Hemingway’s The Old Man and the Sea (in which he suggests that Hemingway has found God), and newly collected gems, such as the acerbic essay “On Criticism” and the beguiling “Note on A Fable.” It also contains eloquently opinionated public letters on everything from race relations and the nature of fiction to wild-squirrel hunting on his property. This is the most comprehensive collection of Faulkner’s brilliant non-fiction work, and a rare look into the life of an American master.